With Album Title of the Year neatly sewn up, we proceed to the music provided us by Rombolá (flutes, tiles, ceramic objects) and Doneda (soprano and sopranino saxophones, radio, objects), recorded in 2008. I've been familiar with Doneda's work for well over a decade but have only encountered Rombolá on a handful of occasions. Still, what expectations I had of the music turned out to fit pretty well, with some exceptions. 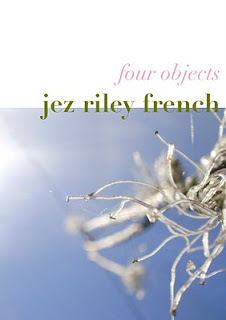 The pair concentrate on breath tones at the harsher end of that spectrum, whooshing through the space, augmented by valve pops, leavened by hummed multiphonics, all in a loose framework that maintains mood throughout each of the five pieces. Well handled, though the general approach isn't going to sound appreciably different than much of what we've heard from, at least, Doneda, for some time. Except for the non-woodwind parts, that is. By including Rombolá's ceramic work and whatever objects that Doneda is manhandling, especially on the first and last cuts, the pair manages to elevate the music into a new and exciting territory. 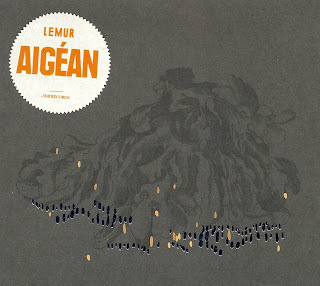 There's something wonderfully chaotic about that clangor mixing with the long, reed-generated tones. Those tracks make the disc worth hearing and, I hope, bode well for future investigation. Oh, and lovely cover art by Alejandra Calabrese! A melding of field recordings near canals around Xochimilco (an area of Mexico City) and improvisational recordings with electronicist Pablo Reche. As has happened dozens of times in the past few years, I'm presented with a item that's tough to evaluate in any sensible way except to remark on how generally enjoyable and/or immersive (or not) I find the recording and whether or not there's something "extra", some emergent quality in the music that strikes a special sweet spot. Well, it does provide auditory goodness, Calarco's choice of sounds tending toward a mixture of wet wooliness, layers of hums, sloshes and warm, wooden knocks, basically straddling the areas implied by the disc's title. It's not overly dramatic, often subsiding into a quiet mix of delicate, everyday sounds, which is welcome. Is it more than that? Not that I can hear. This isn't necessarily a criticism as, in essence, it's perfectly enjoyable to hear, but once heard, it doesn't leave me with questions, hasn't incited any new avenues of thought. Recordings of installations can, of course, be problematic, some more than others. On this and the next one, we find one that manages to work superbly on it's own digitized feet and one that seems more incomplete. Venrooy's "Vessels", which was installed in the Diapason Gallery, Brooklyn, in 2008, is sourced from the varied and often behemoth sounds of cargo ships on the river Waal in the Netherlands, enhanced here and there and overlaid in elastic, viscous patterns. If anything, it might recall some of Olivia Block's work with similar sounds ("Heave To") but Venrooy's sensibility is very much her own. The ultra-deep mix of hums, whirs and echoing bangs that begins the piece evolves into sloshing water and the low thrum of submerged engines. That thrum takes over, a wonderfully complex and rich sound, enveloping the space (I can imagine how this would have worked in situ! ), eventually subsiding back into a set of ringing tones and distant aqueous clangs. The recording runs only a half-hour, but it's time well spent and an impressive addition to Venrooy's already outstanding ouevre. 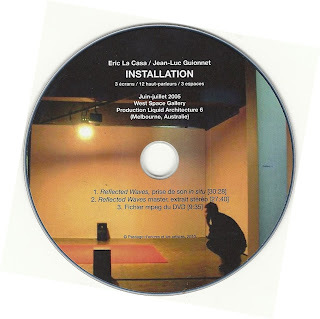 Another discafication of an installation, this one staged in Melbourne in 2005. To these ears, though not without its attractions, it suffers more than the Venrooy by being heard apart from its intended environment; one track here is apparently an unedited room sample, the other was perhaps constructed from various extracts. One gets a strong impression that the spatial character is a defining element, that having the organ chords stemming from one location or several, the voices from others, the bangs and clangs from still others would have a vastly different effect than hearing them issue from a pair of speakers. Putting oneself in the frame of mind to listen as though one was sharing the space helps and it's entirely possible to imagine walking through a gallery filled with these reflected waves. Given that, I don't find the installation quite as compelling as Venrooy's. The organ, presumably Guionnet, is quite nice, oozing through the space, enveloping disembodied voices and all else in its path. Those voices, especially when presented as cold excerpts enunciating single, apparently unrelated words, grow tiresome. Other found vocal tapes, such as a Chinese woman urging a sale of some two dollar item, a couple of pop song shards and a horde of demonstrating union workers chanting slogans, seem haphazard and non-illuminating. But saying all this, it seems, in this case, especially futile knowing how much I'm necessarily missing. The disc lists a DVD mpeg some 9 1/2 minutes long, but I couldn't get it to play on any system--Region 2? The release also includes a very handsome, full-size booklet documenting (in French) the installation. In some ways, the cover image sums things up very well. 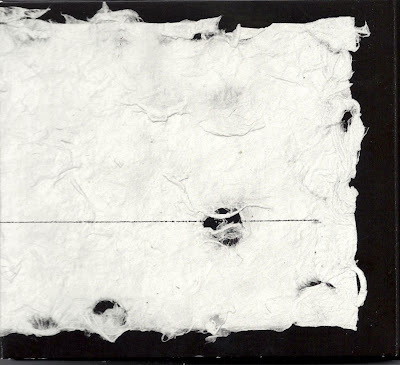 A piece of fibrous paper that's been subjected to a world of wear and tear, resulting in extreme unevenness, holes, tatters. Yet Rowe has drawn on this erose surface as straight a line as he can, as purely as possible, an impossible task given the terrain. The ratio of top to bottom sections isn't quite that golden (1.618 to 1) but perhaps that's also something felt to be ideal but, in reality, unachievable, like an unbleeding, uninterrupted line. Rowe is a man of very strong opinions as is, I suspect, Malfatti. While open to all manner of challenges, there are certain premises to which he holds fast and the Wandelweiser group, generally speaking, doesn't accept them. Given the popularity of these composers in recent years among many of the same listeners who hold Rowe's work in high esteem, he's spoken about his misgivings a bit, acknowledging certain positive aspects of the music while feeling it's overly restricted in others, as though (my interpretation of his thoughts, possibly not his own) their music is but one subset of possibilities and unnecessarily limiting in and of itself. So an encounter with Malfatti, a leading exponent of the Wandelweiser aesthetic, was bound, at least on Rowe's part, to engender an amount of tension. And they run headlong into it on the very first piece. The three-disc set, an extraordinary document, is beautifully structured: two pieces by composers each musician admires on the first disc, one composition by each musician on the second and an improvisation on the third. Malfatti chose to bring along Jürg Frey's "Exact Dimension Without Insistence". I've no idea whether or not he gave any consideration as to how anathema a piece like this would be for Rowe to perform. After all, the guitar part calls for eleven repetitions of a specific pitch, at preordained times over the course of 20 minutes. While he had often performed graphic scores over the years, I'm not sure there had been an instance of Rowe playing precisely notated music since...Amalgam, in 1978? The notion runs counter to several of his deepest precepts, including the freedom to inject whatever sound one chooses (or not) at moments one deems appropriate in the context of the room (and more). Much less having to tune his guitar! Or at least one string. The piece ended up taking the better part of the day to record, such was his difficulty in "just" playing these eleven notes and in the end was compiled by Christoph Amann from fragments derived from several stabs. To my ears, however, the result was worth it. As with much of Frey's music I've heard, there's an underlying sensuousness, even a plaintive quality that comes through the severity of the score in a way I think of as Beckettian. I can't help hearing Malfatti's three notes (I might add that though the score calls for three evenly spaced quarter notes, Malfatti, more often than not, allows a slight bit of extra time between the second and third, indicating he's perhaps not so subservient to the score either) as a kind of call: "Where are you? ", with Rowe's single response, "Here." Frey's sequencing, sometimes alternating, sometimes not, is wonderfully poetic and touching; one almost expects an answer from the guitar after the trombone call; when it doesn't occur, you're worried. Similarly when the lone guitar note is sounded three times with no reply. So much drama wrung from so little material. Rowe brought along Cardew's "Solo with Accompaniment", a piece he knew deeply and containing a "solo" part that would seem to suit Malfatti well, which is to say, one consisting of single, lengthy lines. I'm not at all sure how one is to interpret the score, with its tic-tac-toe-like grids, except to assume that the accompanist, here Rowe, has a great degree of freedom as to how to render the markings therein. Rowe is marvelous here, using some manner of electronics (I've no idea what, exactly) to generate piercing, short wave radio-ish slivers, rich, deep lows and crunchy tinkles that may be scouring pad sourced. The two often sound in quasi-unison, Malfatti's sonorous, pure horn the perfect foil for Rowe's scattered abrasions, yin/yang, Malfatti steadfastly tracing that line across the ravaged, bedraggled soundscape. The score for Malfatti's "Nariyamu", as reproduced in the tray behind disc #2, appears to be fairly simple (only one page is shown--I'm not sure if that's it in its entirety or not) but its realization is very complex and subtly beautiful. The essential element is unison or near unison held notes by trombone and electronics, Rowe generating a multi-layered buzz, crescendo and decrescendo, more or less matching Malfatti, with a substantial rest between sequences. But right from the beginning, there are tiny activities occurring alongside: what initially seems like Malfatti gently tapping his fingernails against his horn as well as drip-like sounds. A kind of regularity nonetheless accretes via the main sequence, but several minutes in, this falls apart, orients itself, re-coalesces, continues on. As in much of Wandelweiser-area music, the real beauty lies in the poetics of the choices made--where to alter the schema, where to allow extra silence, what groupings to choose, how to subtly inflect the sounds generated. "Nariyamu" does this brilliantly, becoming a living, breathing creature and, going out on a limb, I can hear in Rowe, given somewhat more freedom of exposition, a growing appreciation of this aspect of Malfatti's, and by extension, Wandelweiser's work. Rowe brought along his "Pollock '82", a new set of pages created for this session. Unlike the Malfatti or Frey scores, his is pure graphism, consisting of actual details from Pollock paintings, reproduced in ink by Rowe and laid out, intuitively spaced, on staves. Though the score, as seen beneath the tray for Disc 3 here, includes several sections of dense blottage, the rendition as heard continues along the sparse, quiet path previously followed, albeit with an absence of clear pattern. Malfatti, who had introduced percussive elements in the prior piece, here presents breath tones and windy growls for the first time; he still pretty much maintains that respiratory rhythm, exhaling to produce sounds, inhaling in silence, a slow, subtle pulse. Rowe keeps his palette light, using high, scattered tones, the odd plucked note, scraps of static and tracings of contact mic, as though these particular spatterings of paint are microscopic portions of the whole. It's a very strong, very complex performance, the intricacies of which I think I'm only just penetrating. The improvisation making up Disc 3 is easily the most difficult to write about or, for me, to grasp. I do have the impression that it's Rowe at the helm to some degree. He's operating in what I think of as "Twombly mode". As opposed to the Rothko-inspired "tingeing of the space" approach of several years ago, I get the sense of him encountering a very large, white canvas upon which he make art marks, leaving much of the surface untouched. Dots, squiggles, smears, a dab of REO Speedwagon. Not that Malfatti is merely tagging along, hardly so. He supplies much of the color, the stains of hue that give depth to Rowe's marks and often links to surprising emotional power as when he inflects, up or down, his low trombone tones so as to recall whale song. The space is so vast, so little to hold onto. I'm not sure there's another improviser willing to cede so much space as Rowe though, at least in this respect, he fits right in with the Wandelweiser aesthetic, an arrival at a similar point via differing paths. There's a quiet monumentality achieved here, an appreciation of the sheer largeness of space, with a tacit acknowledgment of how little, how subtly, we affect it. Again, this piece will doubtless reveal more and more for years to come. I do enjoy me some obsessiveness on the part of musicians. I've almost invariably found a lot to like in Kamerman's music over the past few years, both live and on disc, including his propensity to not be pigeonholed so it's a special pleasure to hear these four variations on a fairly tightly controlled theme, recorded just over two months ago. There are only three or four elements in play throughout, arrayed similarly on each track, with minor but crucial differences: a very low, cottony rumble, a medium range, large-grained static spray that's iterated in a regular, slow pulse, a high, keening series of tones and a mid-range kind of buzz that reminds me of the tail end of a Jew's harp twang. The general effect might be said to be of a bleak industrial soundscape but an essential difference occurred to me while listening: most such examples, at heart, sound as though they're constructed, contain gestures, if you will, that bear the stamp of the musician involved. 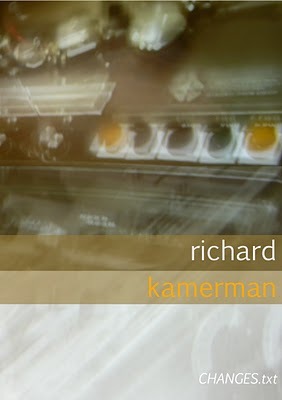 Kamerman has, to my ears, managed to remove himself to a large degree, to have created something that really sounds as though it could be a found recording of a marvelous, empty, throbbing, sputtering space. No mean feat. The static may come in one burst here, two there, the high-pitched whine varied within itself and as to when or how often it appears. Only the last, brief (two minute) track, suitably titled, "in which I let go", shifts gears, a series of random knocks and bumps, almost as though the power has been turned off and the pipes begin to clank as their temperature subsides. Excellent recording, do give a listen. An intriguing selection of three very different pieces from Duplant, a bassist who I don't believe I've heard before (as ever, said with great hesitation). "arras, une heur trente d'arrêt" combines field recordings, largely of a mother and children speaking (in French), small percussive objects, between-radio-stations type buzzes and, notably, someone whistling a melancholy almost-tune. It's a very full, vivid and wonderful work, not a little reminiscent of Ferrari; something about the combination of sounds is both warm and subtly disturbing. 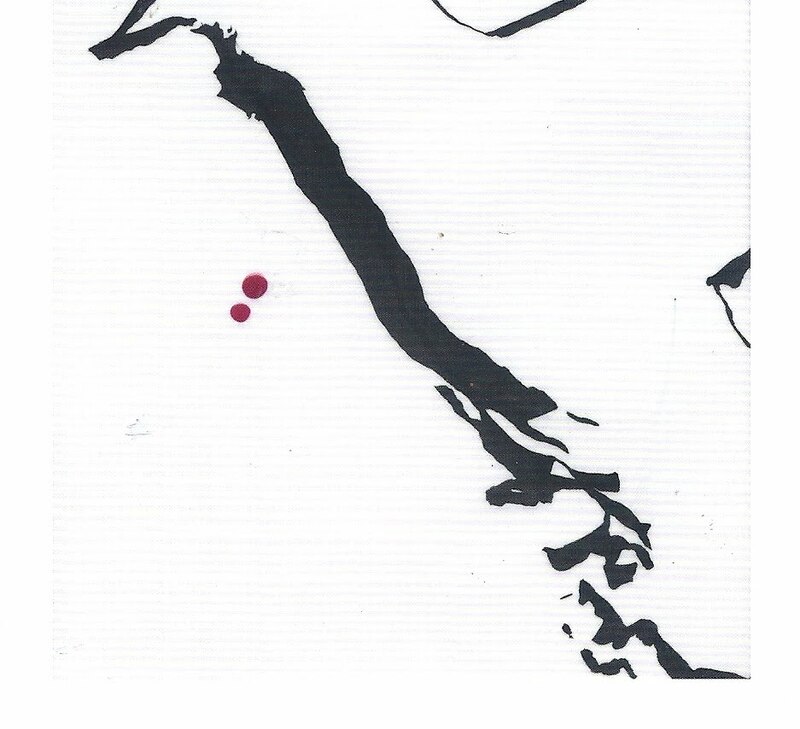 "one for for five (who goes slowly goes" is indeed for a quintet (Vanessa Rossetto/viola with small motors, Paulo Chagas/bass clarinet, Lee Noyes/inside & outside piano, Phil Hargreaves/flute and Duplant/double bass and graphic score). The score is included on a separate card, where it's titled "one four for five"--not sure which is correct--and it seems fairly straightforward, each instrument having approximately timed sections in which to play with both graphic and written descriptions ("long notes", "what you want with rhythm", etc.). The result is thick and, not in a bad way, sluggish, like a viscous liquid. 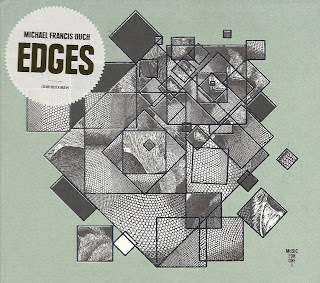 It's engaging enough, though marred, to my taste, by many of Chagas' contributions which tend toward a stale kind of free jazz playing that seems very much out of place here (though, I suppose, it might be exactly what Duplant wanted). "nord" takes another sharp turn, consisting of field recordings (highway sounds, mostly), double bass and, most noticeably, an old vinyl recording of...I'm not sure what, but something along the lines of an East European brass band playing a kind of dirge (a doina?). 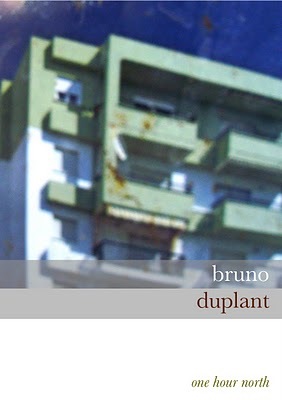 Whatever, it's an unusual and enjoyable combination of sources, Duplant confining his sounds to commentary here and there, allowing the traffic and phonograph to define the terrain. Good piece, interesting and largely enjoyable album. Label owner French's latest self-descriptive offering of four 10-minute recordings sourced from four different objects, straddling that hazy line between science experiment and art (often an imaginary distinction, imho). "a piezo disc slowly breaking..." is a delightful track, full of delicate pings and pops, slightly reminiscent of Xenakis' marvelous "Concret pH", the sort of thing I can listen to for quite a while, the sequence of sounds having that nice blend of irregularity on a small cluster level but a general regularity when one moves up a stratum. His recording of a teasel plant is spiny and woolly, a similar area that Jeph Jerman has explored, but somehow wears out its welcome for me after a few minutes. Odd how some things, inherently not so different, have differing effects, I imagine varying widely from listener to listener. The following track, picking up vibrations within a slate window sill is, again, quiet wonderful, the low, complex hums forming patterns I could happily listen to for hours. The last cut, having to do with sounds emitted by a flask filled with hot water some ten minutes prior to recording, those sounds dwelling in the range of sputters and gasps, I find somehow less compelling, perhaps too one-layered, I don't know. But aside from the basic pleasure one does or doesn't derive from the pieces, they cause one to consider why this is so and, of course, to simply listen more closely, always a plus. I don't think there was much doubt about how this release was going to sound, generally speaking. 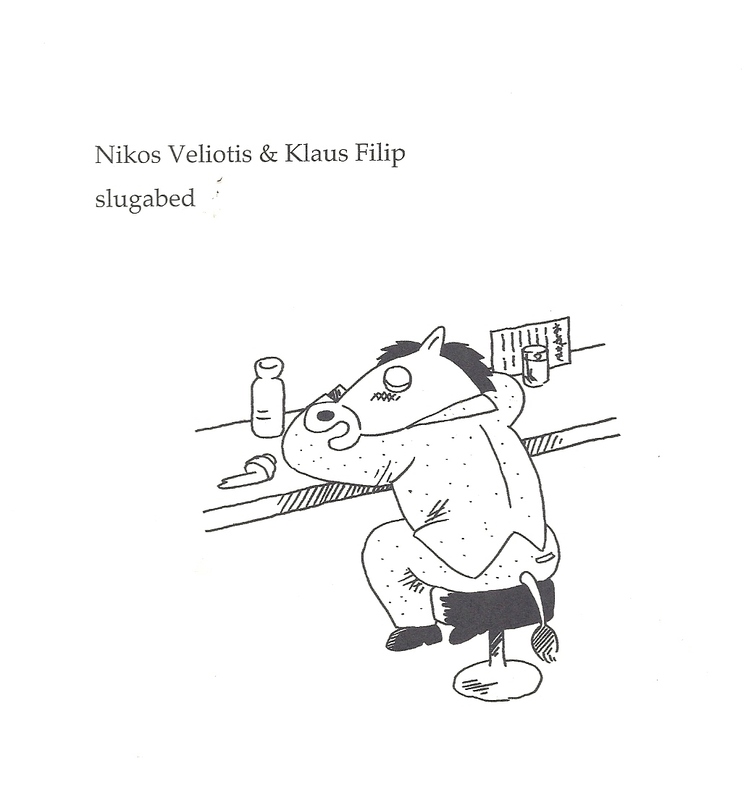 Not sure if I've ever heard anything but drone-related material from Veliotis (except perhaps when he was sawing apart his cello and even then...) and, indeed, for his part, he maintains an hour's worth of sustained drone here. He does so very well and it might have made for an an enjoyable enough effort were it just him but, joined by Filip, presumably using his lloopp software, the result is endlessly fascinating, even magical. Veliotis seems to stay pretty much centered around a given pitch, varying the harmonic cloud around it, the dynamics and the raspiness of his attack. With this as the base, Filip interweaves his output in marvelous fashion, sometimes trying to get close to the cello sound, becoming all but indistinguishable from it, more often enveloping it in cushions of air, hot and cold, calm and rushing, silvery, breathy, cavernous and claustrophobic. The tension is constant and invigorating. Not sure what else to say except, as I've mentioned before, to my ears there's drone music and then there's drone music. This is as fine an example of the latter as I've recently heard. Get it. 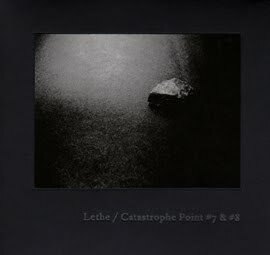 I greatly enjoyed my first exposure to the work of Lethe (Kiyoharu Kumwyama) last year on Catastrophe Point # 5 (Intransitive). Here's a continuation (I guess I missed #6), a two disc set recorded in 2004 (Lausanne) and 2006 (Edinburgh). The milieu remains the same: extremely dark, forbidding, vast and post-industrial, shards of sound echoing into the depths, metal bars dropped onto hard floors, wails, alarms, groans, heavy steps...you get the picture. Gradually drone-y electronics filter in which take it out of the processed field recording area, into more of a dark ambient one; I prefer the former, though Lethe handles everything with deftness. Piano enters, low and foreboding, reminding me a bit of some of Asher's work, there's a crescendo of rushing winds and clanging metal, all hugely dystopic and effective as such but...at some point it blends together overmuch, feels a bit too easy to achieve; the sense of exploring the darkness I had in the earlier work isn't as apparent, as if Lethe has mastered this particular realm and can display his artistry at will. 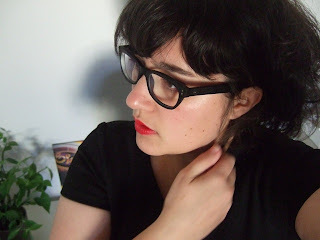 The second, more recent recording is sparser and better off for it, no less dark but with a more interesting atmosphere, not merely oppressive but grimy and empty as well. There's less "musical" input, more noise. The final piece, just echoing thumps and bell tones in the darkness, is quite impressive. Still, it's a ton o' murk, probably a larger helping than most can take in a sitting, but if you're so inclined, Lethe doth provide. 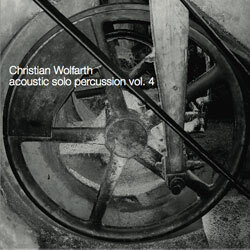 In which Wolfarth continues his quixotic journey documenting various percussive attacks on 45rpm vinyl, one approach per side. Side G is "Cabin No. 9", a study in cymbals, what sounds like a large cymbal on a snare set up like sock cymbals, opened, closed and battered for four minutes plus. It's an odd thing for me to judge in any way--it kind of just sits "out there", with no context but its own sound, which is enjoyable and rich enough. It's difficult, though, to get past the "example" nature of the track. "Well Educated Society" is six minutes of deeply bowed metal, writhing and groaning, somehow coming across as much more of a fully realized piece than the obverse side. It's dark enough that it would fit right into the Letheian universe above but has the saving virtue of a well-realized duration. The subsidence into a troubled drone at its conclusion is quite moving. Worth it for this side alone. This marvelous release appeared late last year, seemingly out of nowhere, and quite tough to get stateside until just recently. Double-bassist Michael Duch seems to be something of a staple of this Norwegian label, appearing on all three discs herein reviewed, joined for this date by the estimable talents of John Tilbury and Rhodri Davies. The results are gorgeous. Although five of the six pieces consist of work that falls into Cardew's more abstract designs, incorporating graphic images and post Cagean indeterminacy, the trio opts for a gentle approach that stresses his warmth and, perhaps, reads the scores with an ear cocked toward his future, more populist work. Tilbury...well, this is just some of the loveliest, most sensitive Tilbury you can find, again often referring to the Cage of "Sonatas and Interludes", always remaining ambiguously tonal and always displaying his unerring dynamic and metric senses. One can listen through, concentrating solely on his contributions and come away deeply satisfied. But the others are no slouches either. Davies stays with the "traditional" harp approach (no ebows to be found) and is such a perfect foil for Tilbury, sonically adjacent but with just enough distinction to conjure forth two vines from related species, intertwining, producing complimentary though varied blooms. Duch's sound is rich and deep, occasionally (oddly enough) evoking the kind of sound Dave Holland had back in the late 60s, early 70s, one with just a tinge of an awareness of folk forms. Highlights? Well, "4th System" is utterly wonderful, a leisurely unspooling of passages that meander off to the side, eddy, rejoin each other, Tilbury nodding to gamelan, Davies taking pointed jabs, maintaining a definite character throughout the work while still imparting an improvised feel. Interesting to compare "Solo with Accompaniment" with the rendition on the Rowe/Malfatti "Φ", arco bass taking the "simple" solo part, a long, sustained tone, while the others clatter and rumble athwart, more rambunctiously than Rowe though, it sounds to me, just as appropriately given the less severe context. When Duch shifts to pizzicato, that aforementioned tonal similarity to Holland is striking and, to my ears, quite welcome. The trio performs a lengthy (some 20 minutes) extract from "Treatise"; inexcusably, the page(s) aren't provided. It's the sparest piece here, though hardly astringent, merely making a more overt usage of silence and sound placement than in the other works. Again, Tilbury is just absurdly fantastic here, navigating the score with delicacy, sly humor and deep appreciation for his late friend. 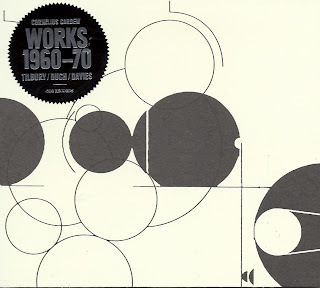 The kicker is "Unintended Piano Music" (arranged for the trio), a piece that to an extent anticipates Cardew's political song forms of the early to mid 70s. Those works are quite controversial, of course (I tend to like them very much), many considering them retrograde and reactionary. This one, as near as I can tell, doesn't refer directly to an existing ballad or protest song but certain conforms to a regularity of form not heard in his previous music. Low arco bass and dark, deep piano notes lay a ground for a poignant, plaintive harp theme, the piano responding with a troubled denial of the harp's aspirations. Meaning it in a good way: this could be a perfect piece of movie soundtrack, highly evocative, both beguiling and disturbing. An exemplary album, all told. No excuse whatsoever not to have this one. Here we find Duch on his own tackling five works: "Edges" (Wolff), December 1952 (Brown), Octet '61 (Cardew), Projection I (Feldman) and For Strings (Skempton), a demanding enough program. Wolff's instructions for "Edges" (a graphic score) include the wonderful lines: "The signs on the score are not primarily what a player plays. They mark out a space or spaces, indicate points, surfaces, routes or limits." I wish my head could maintain a working reference to other performances of this I've heard, but that's beyond its capability, so I can only take Duch's rendition on its own terms. It's quite active, even vociferous at times and part of me somehow expects more sparseness; sonic density isn't something I usually associate with Wolff. Still, it's a pretty exciting, immersive work; Duch's technique might be a bit flamboyant for the material (imagine Barry Guy doing the same piece) but just when you think he might be going too far in the pyrotechnic direction, he reins things in. The Brown is more pointillistic, rough smudges of tone, kept fairly short. Duch expands things quite a bit on the Cardew, varying his attack widely and delivering extraordinarily powerful whipsaws of arco from the bowels of his bass, cleaving the air--very dramatic indeed, nice job. With Feldman's "Projection I" (1950), we return to a sparser mode, plucks and strokes arrayed on a field. The Projections were intended to be played quietly and Duch does so, giving the brief piece something of a Twombly-like character. Skempton's "For Strings" is a minor revelation here (not sure if I've heard another version or not). There's a lovely airiness in effect as well as a kind of playfulness, an extended section of dry, raspy bowing that sounds like wind whistling between ancient timbers. A tough proposition, taking on these pieces by oneself but Duch does a pretty decent job of it though, from the evidence at hand, I think he readily benefits from having players as able as Tilbury and Davies surrounding him. Lemur is a quartet of Duch, Bjørnar Habbestad (flutes), Hild Sofie Tafjord (horn) and Len Grenager (cello), a chamber-like ensemble, improvising. For me, while engaging enough and very well and energetically played, it doesn't quite work largely because the language employed is far too derivative of contemporary classical music tropes. 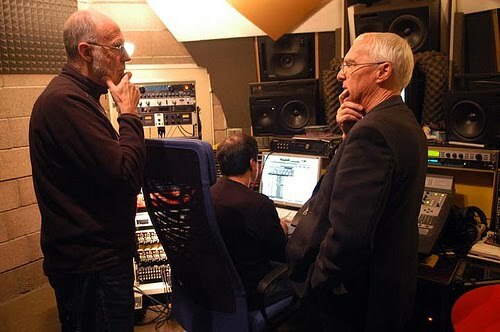 In other words, it sounds as though their palettes are taken from all the techniques they've learned and mastered through their careers rather than reacting to the moment, the space, the personalities of their collaborators. Very much akin to a "free" jazz session wherein one hears recycled Coltrane, Ayler, etc. Inevitably, a kind of sameness settles in and there's little feeling of true exploration occurring. Good free improv is difficult, no matter the instrumental proficiency of the musicians. "108" (the numbers in this series indicating how many performers were involved) was by far the largest ensemble for which Cage ever wrote. The task is undertaken here by the 11-member Chance Philharmonic, presumably overdubbed to fill the necessary seats. The piece is first presented as such, next (in the guise of "109") with the simultaneous performance of "One8" (originally for solo cello, here played--I think, it's not specified--by Karen Krummel) and finally "110", which is "108" augmented by "Two3" with Tamami Tono (shō) and Glenn Freeman (conch shells). 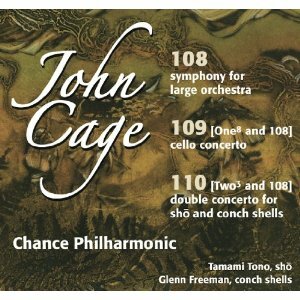 "108" itself, even to the knowledgeable Cage listener, comes across as a surprisingly traditional sounding work although Cage, as he would say numerous times over his career, thought that he was finally creating the music he always wanted to. Long-held notes by winds and strings with the odd, brief hiccup from trumpet or percussion waft by, overlapping at irregular intervals, all very serene like fronds swaying in the breeze. Tonal enough, with some sourness and piquancy, the choice of tones and intervals chance-generated, I take it. Several periods of silence are interspersed as well, layers of mist periodically obscuring the vegetation, allowing for contemplation of the listener's ambiance. The addition of the cello piece in "109" projects a slightly darker, eerier tinge onto the work, the moments where it sits alone being particularly striking. "One8" was written for Michael Bach who invented (? it seems to me I've heard others make this claim, not sure) a curved bow capable of playing all four strings at once and the effect remains striking. The addition of the shō and the mic'd conch shells filled with water to various degrees provides more of a contrast, the mouth organ's sounds splaying into the foliage, tendrils curling around stalks and blades, the occasional gurgle of the conch giving indication of the liquid below. This additional pair of sounds really fills out the composition which, seasoned though it is, can well utilize just this much additional flavoring. The push/pull of that East/West dynamic plays out well too. Of the three pieces, this one seems to me the fullest. But all three are worth hearing. Another very good job from the OgreOgress crew.